Everybody knows the legend of Captain Kidd, America’s most ruthless buccanneer. Few people realize that the facts of his life make for a much better tale. Kidd was actually a tough New York sea captain hired to chase pirates, a married war hero whose secret mission took a spectacularly bad turn. 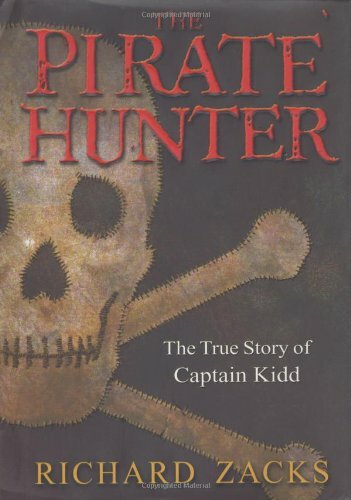 This harrowing tale traces Kidd’s voyages in the 1690s from his home near Wall Street to Whitehall Palace in London, from the ports of the Caribbean to a secret pirate paradise off Madagascar. Author Richard Zacks, during his research, also unearthed the story of a long forgotten rogue named Robert Culliford, who dogged Kidd and led Kidd’s crew to mutiny not once but twice. The lives of Kidd and Culliford play out like an unscripted duel: one man would hang in the harbor, the other would walk away with the treasure. Filled with superb writing and impeccable research, The Book Pirate Hunter is both a masterpiece of historical detective work and a ripping good yarn, and it delivers something rare: an authentic pirate story for grown-ups. Pirates! : Brigands, Buccaneers, and Privateers in Fact, Fiction, and Legend Pirates! is a virtual encyclopedia covering brigands, buccaneers and privateers in fact, fiction and legend, quite literally from A to Z. In more than a thousand entries (each impeccably researched, internationally focused, and extensively cross-referenced) reveals the actual lives and exploits of pirates and the diverse worlds from which they sprang, from Etruscan and Phoenician marauders off the coast of ancient Greece to the Chinese and Malay pirates of the 1870s. Jan Rogozinski unravels the pirate cliche to present the often more fascinating (and human) reality, forever altering our view of them as drunken cutthroats or Errol Flynn-style heroes. Beyond its immense value as a unique and hugely entertaining resource, Pirates! explores the rich mythology that has developed since their demise and examines their image as pop culture icons. From pirate slang to fictionalized buccaneering to listings of the richest booty ever captured, Pirates! is an authoritative and invaluable reference work for students, researchers, and non-specialist general readers alike!